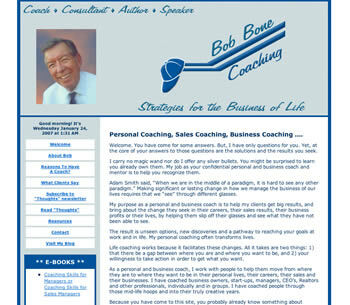 Bob Bone decided he wanted to work with someone he was already working with and trusted, and we wanted to add web design related work to our portfolio. So his first website was our first web site project. Through a couple of revisions, we were still happily working together for more than 11 years. Now the relationship has changed. After decades of involvement in real estate, coaching, civic involvement, etc., Bob has finally decided to "hang up his cap" and enjoy a quieter pace in retirement. Bob will remain a friend we are proud to have, and we will always be grateful to him for being our first project. Want to work with a company who will make a long-term commitment to your satisfaction? Contact us.